These one-day workshops are the place to learn new skills, brush up on old ones, try new materials and approaches, and experiment and explore in a friendly, supportive environment. Complete novices are welcome as well as those with some art experience. Focusing on building basic, practical artmaking skills, this is the most comprehensive beginners program around. Each month students learn techniques specific to a medium, while also studying how other artists have used the medium in the past. The program starts in February with an introduction to the humble pencil. Explore basic shapes and forms using the humble pencil. Discover the versatility of graphite in both pencil and stick form. We will start with a variety of different marks to build up a drawing vocabulary. Break down complex forms into simple shapes. By applying your increasing sensitivity to line, tone, texture and composition, we build both skills and confidence, while searching for ways to interpret our subject. This month we continue to explore and experiment with graphite. We will work on simple exercises to build up your vocabulary of mark making, paying attention to line, tone, texture and composition. Build on skills and confidence while searching for ways to interpret our subject. A great class to learn some important drawing fundamentals. While this is a continuation of last month’s lesson, it is also a stand alone class and not essential to book into both. Charcoal is a medium renowned for its versatility, rich depth of tone and contrasts. A popular medium used by many artists throughout history. Using simple still-life objects as subject matter, this workshop is an opportunity to learn fundamental properties of this versatile medium. An introduction to understanding and using colour. This is the perfect class if you’ve never painted before, love colour or just want to understand and experience how to mix and enjoy colour. Applicable to any medium that uses colour. In this class you will complete a basic colour wheel that takes approximately 2 hours to paint. This will equip you with skills to mix complex colours from the primaries, begin to understand how artists use colour, and see basic colour theory in action. A popular and fun, watercolour is a favourite among many artists for its fluidity and transparency. You will learn some basic techniques in brush control and mark making, complete a colour chart and learn about glazing. Experimentation is encouraged. This month we continue our exploration into the wondrous qualities of watercolour. This class is an opportunity to build on techniques learnt in the June workshop. For newcomers, Brenda will explain and demonstrate basic watercolour techniques, brush control, mark making and simple glazing methods, set simple and practical exercises to get you on your way to experimenting with colour and composition. Pastels appeal to our all senses. Their chalky texture, and pure colour pigment are held together with a minimum of binder medium and are the perfect medium for exploring both colour, and bridging the gap between painting and drawing. 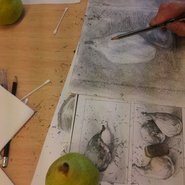 We draw from simple still life objects using a limited palette and then try expanding our colour palette, using a more personal response and a variety of drawing techniques. You will make your own design from a drawing of your choice and learn how to translate this into a black and white lino print series that can be hand coloured. You will be taught registration, plate preparation, how to safely and effectively cut the block. We will experiment using a range of papers, so that you can continue printing when you get home. Visual resources will be provided, but please bring some images of your own if you wish.